Beijing and Shanghai share amazing skylines, but they present interesting contrasts. The past is hard to find outside the tourist sites in central Beijing, China’s political capital, now numbering over 20 million people. Recent prosperity means that five million cars are now bumper to bumper on new landscaped highways that circle and criss-cross the city and stretch for miles beyond. Think of Los Angeles on steroids. Shanghai, a much newer city, is even bigger, some 23 million people. But despite crowded sidewalks, it seems more manageable. The traffic is less frenetic and it is a much more inviting city for strolling, perhaps because it has a more familiar feel. The city only began developing into a major port in the 1840s, when it attracted many foreign residents who built Western style banks, businesses and mansions. By the 1930s, Shanghai was known as the Paris of the East. The foreigners left during Mao’s “cultural revolution,” but they’ve left a legacy even as the city has rebounded with a vengeance as China’s business center. Both cities have amazing architecture. The building boom that began around 1989 in Beijing went into high gear in 2004 to show off to the world for the 2008 Olympics. By the end of that year, there were 895 completed skyscrapers, and the work goes on. 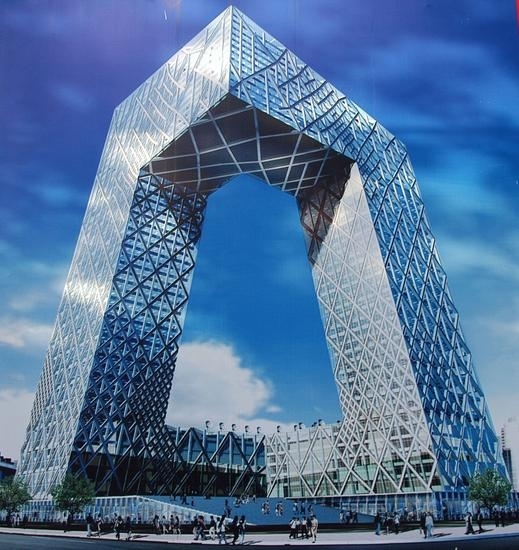 CCTV by Rem Koolhaas in Beijing. Much of it seems deliberately designed to impress. The China Central TV headquarters by Dutch architect Rem Koolhaas, is built of horizontal and vertical sections with a gaping opening in the center. Wagsters have said the shape resembles a squatting figure and given it a playful nickname, “Big Stoop.” Pangu Plaza, dubbed the “dragon building,” stretches the length of seven football fields, ending with a high-rise tower with a top resembling a dragon’s head. The plaza has seven jumbo television screens on its façades. But Beijing, where the tallest skyscraper is a mere 63 floors, can’t compete with the new Shanghai when it comes to height. The Pudong business section across the Huangpo River was farmland just 20 years ago. Now it is home some of the world’s tallest towers. The 101-story World Financial Center claimed the title from the 88-story Jin Mao building in 2010. The Center boasts of the world’s highest observation deck and one of the highest hotels, the Park Hyatt occupying floors 79 to 93. But it, too, will lose bragging rights when the 128-story Shanghai Tower is completed in 2014. The Oriental Pearl Tower, an observation tower and antenna built in 1994, provides a bit of whimsy in the Shanghai skyline. With a shape Disney might admire and lights that would be at home in Las Vegas, it has become the symbol of the city’s new spirit. Along with all the distracting new, Beijing and its environs hold some of the most important sights of old China. Within the city proper, first stop is Tianamen Square, a vast open space best known for past political demonstrations, but usually just crammed with tour groups. The biggest attraction is Mao’s Mausoleum, where long lines wait to pay respects to the embalmed body of Chairman Mao. Most groups skip the sights of the square to walk through the Gate of Heavenly Peace to the vast Forbidden City, where 24 emperors ruled for nearly 500 years, 1420 to 1911. It consists of courtyard after courtyard with elaborate buildings in Chinese style, holding some 9,999 rooms. Some of the impact is lost because you cannot enter the buildings, but the architecture is classic and the gardens with fantastical rock formations remain marvelous to see. The other main sites of the emperors, the ornate Temple of Heaven and the Summer Palace, are impressive, though again you cannot go inside. Getting there was part of the fun. In the park outside the Temple of Heaven, we came upon Chinese ladies doing their Tai Chi exercises and playing a game called Jian Zi, using a feather bird like badminton but played entirely with the feet. The Summer Palace is reached by a delightful ride across a lake in a dragon boat. The Great Wall. Photo by Eleanor Berman. The Great Wall, half an hour north of the city, stuns the imagination, winding its way across the tops of mountains as far as the eye can see. Cable cars take visitors up the mountain to reach the wall. 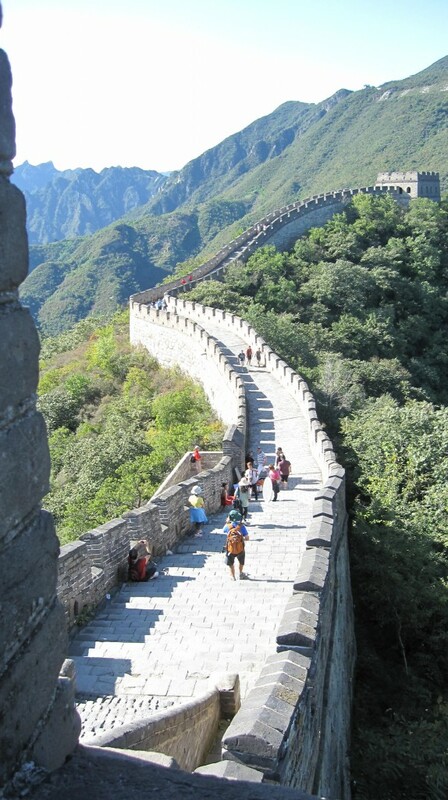 The further you walk on the wide, steep paths between the walls, the more remarkable the views. Construction began in the 5th century BC to keep out foreign invaders, and took its present form under Quin Shi Hunagdi, China’s first emperor, around 221 BC. It has been fortified and extended by subsequent rulers over the centuries, especially during the Ming Dynasty (1368-1644). Depending on which guide you read, it stretches from 3500 to 5500 miles. Beijing’s most strollable section is the old Hutang district, where there are man-made lakes and small homes with courtyards lining narrow winding streets. But this, too, is changing. Some of the homes have become trendy cafes and the oldest structures, like most of the city’s older housing, are being bulldozed to make way for something new and high rise. Residents who lose their homes are given cash or moved into the tall apartments that are going up for miles on the city’s fringes. Shanghai’s European past can be seen in a pleasant walk on the Bund, a wide promenade along the Huangpo River flanked by the handsomely restored hotels, banks, and clubs of the colonial era. The “concessions,” the neighborhoods where foreigners settled, are interesting for their architecture and the excellent restaurants that cluster here. The original Chinese flavor remains in Shanghai’s “old city,” and its serene Ming Dynasty Yuyuan Gardens. With a nod to the new, the gardens are now surrounded by the bustling Yuyuan Bazaar, a mecca for tourist souvenirs. 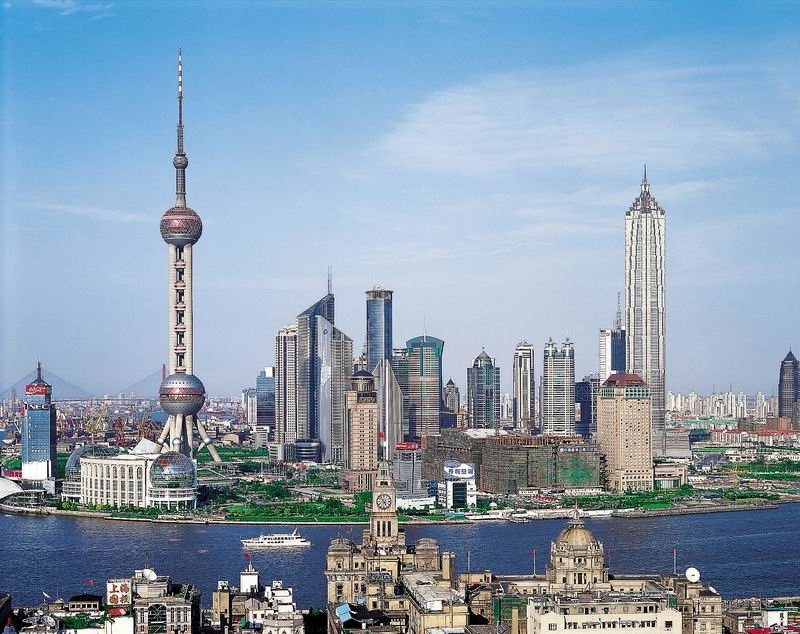 The Shanghai skyline is a wonder best admired from observation decks in Pudong’s tall buildings, and you can spend a most worthwhile day in the Shanghai Museum, a collection of 120,000 objects, the very best of China’s timeless arts. Bronzes, ceramics, calligraphy and painting are on display, along with sculpture, jade, furniture, and colorful ethnic costumes. Shanghai shopping is non-stop on the pedestrians-only Nanking Road and the equally popular Huaihai Road, with malls to the east and designer boutiques further west. Because China is so huge, requiring several flights to see the important sights, and because so few people speak English, the easiest and most practical way to go for many travelers is with a tour. Typically, tours include Beijing, Shanghai, and the smaller cities of Xian and Guilin; better tours also take you into the countryside to places like Yangshuo and Long Sheng.